1 bedroom, with loft space for relaxation or "creative space"
Potting Shed Sopley is a small detached holiday cottage that has been recently converted and can sleep two people. It also has a spacious loft space, ideal for relaxing with a good book or being more creative with some artwork. The downstairs comprises of a well-planned principal room incorporating kitchen/dining and living area with recently installed wood burning stove. To the front of the property there is a shower room and double bedroom. The loft is accessed via a purpose designed staircase and leads to an open gallery and studio which overlooks the main room. Outdoors there is a large lawn and terrace with a BBQ area and chiminea for outdoor living. There is parking for one car on the driveway and no shortage for other parking on the road outside. Situated on the edge of the New Forest the Potting Shed is located in the small village of Sopley, on the Dorset/Hampshire border near the south coast of England. For those who enjoy the outdoors there are plenty of opportunities to enjoy walking and cycling in the New Forest or Avon Valley Footpath which runs through Sopley village. 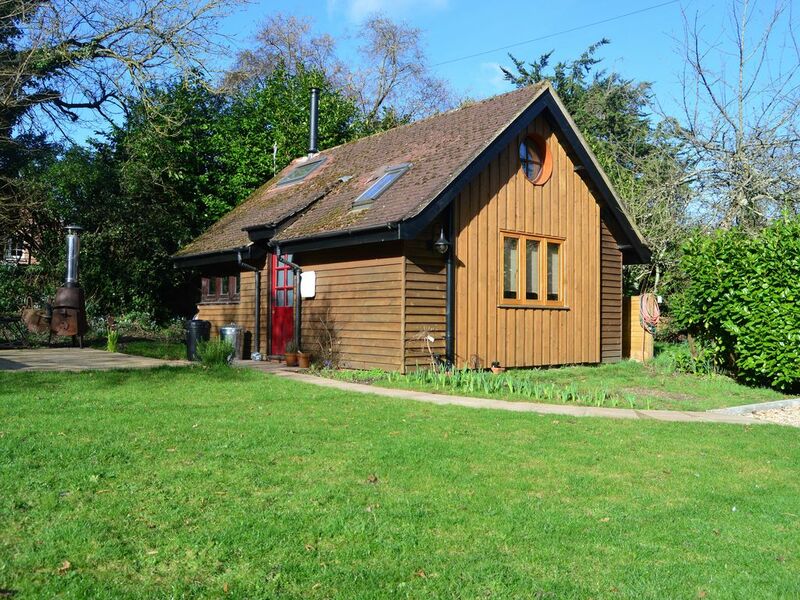 Also well suited for anglers wanting to fish in the two local rivers or the Mudeford Estuary. There are excellent nearby beaches including Bournemouth, Mudeford and Hengistbury Head. Christchurch, Ringwood, Bournemouth and Salisbury are all close by and offer excellent days out for those wanting to enjoy time visiting historical buildings or shopping. Poole and its exceptional harbour, favoured by sailors is a short drive away and offers plenty to explore within the Purbeck peninsula and Jurassic Coast. I live locally in Bournemouth with a young family, who keep me on my toes! Before children I was a physiotherapist, but now dedicate most of my time to looking after our 2 small children and supporting my husband who is training to be a vicar. My parents bought 21 Sopley in 1979 as they were driving through Sopley for under £20,000 and took me and my sister to this cottage for years. It was a real "step back in time" with no telephone or TV and frequently frozen pipes! We loved exploring the New Forest and beaches locally. Later, my Dad bought a plot of land next door and put a Potting Shed on it for storage. in 2016 we decided it would be more use as a holiday chalet so worked on converting it into a simple one bedroom chalet with a quiet loft space. It is now a lovely self-contained cottage with a large living, kitchen, dining area and beautiful garden to enjoy the outdoors. Although you are relatively close to "civilization" it still feels quiet and peaceful staying at the Potting Shed. The garden is full of nature and in the summer it is especially nice for enjoying the sunshine and perhaps a BBQ. In winter there is a log burner stove to give the Potting Shed a really "cosy" feel. There is a pub opposite, the Woolpack for easy access to food or drink. The potting shed is lovely, the photos don't do it justice. A great location for exploring the new forest, very clean and great amenities. Had a lovely four day stay at 'The Potting Shed' everything was just perfect, would definitely come back again. I stayed at The Potting Shed alone and, because of its compactness, I felt very cosy and comfortable there. The immediate neighbours are quite quiet and the fact that there was a gate to the property gave an added sense of cosiness. I was able to do lots of walks in the local area and beyond and enjoy all the wildlife and the coastal scenery, as well as take lots of pictures, so it was a perfect holiday for me. The Potting Shed had everything we needed, in a wonderful location. We had a lovely stay, exploring the local area. It was well appointed with everything you would need. It was lovely and quiet with the pub just across the road who also gave a warm welcome. The fire was great and just what was needed on a miserable grey wet December weekend. Charming, comfortable accommodation in a lovely area. The property was comfortable, clean, well equipped and nicely decorated. When we arrived, there were lovely welcoming touches - a note, tea, coffee, milk and fresh flowers. This was a lovely start to our stay. The property is ideal for a couple and is well located for exploring the area. We had pleasant excursions to Christchurch, Boscombe, Bournemouth, Ringwood and Lymington. We ate every evening in the Woolpack Inn across the road; the food was good, reasonably priced and the staff were very friendly. We would heartily recommend this accommodation as an ideal base for exploring the area.